This new product line features 43 handpicked properties in 15 destinations. Accommodations include ocean-facing suites and villas with private round-trip transfers, as well as the option to dine from the menus of award-winning chefs, enjoy expansive wine lists, butler service and more. 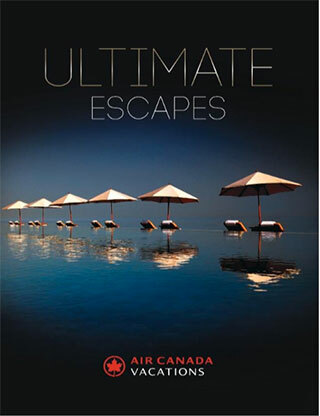 “Our Ultimate Escapes Collection meets the needs of clients looking for a vacation offering the epitome of luxury, that they can book in one place with the trust and convenience of booking with Air Canada Vacations,”said Nino Montagnese, Managing Director. All packages come with round-trip flights aboard Air Canada or Air Canada Rouge, departing from 64 Canadian cities, as well as complimentary advance seat selection, preferred seating when available, priority check-in and boarding, and a one-time bonus of 1,500 Altitude Qualifying Miles for Altitude members. Groups can also choose to elevate their Ultimate Escape by booking a 58-seat private jet with Air Canada Jetz.